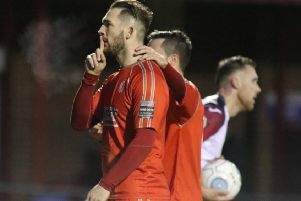 ﻿For the second week running Alfreton Town returned from a difficult away fixture feeling they could, and perhaps should, have gained maximum points. This time they drew 1-1at Bradford (Park Avenue). ﻿Reece Styche returned from International duty with Gibraltar to nudge the Reds ahead in the 76th minute with an exquisite overhead kick after Richard Peniket had flicked on Josh Clackstone’s long throw. It maintained Alfreton’s proud record of scoring in every one of their 22 competitive away games this season. 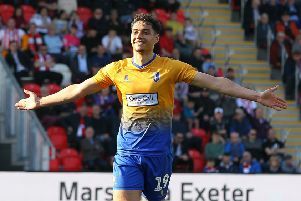 Controversy reigned though three minutes later when Danny Clarke was bowled over by Danny East, shortly followed by Styche being blatantly impeded by Gianluca Havern as he shaped to cross from the bye-line — both penalty appeals were waved aside. And it was Havern who scored Bradford’s equaliser with just four minutes remaining, lashing home Nicky Clee’s left flank cross from 12 yards, leaving the Reds to rue a string of missed chances in the first half, particularly when Dec Bacon was played through by Jordan Sinnott on 29 minutes only to fire straight at keeper Charlie Andrew. Bacon had a couple of other good chances that were blocked, whilst defenders Clackstone and Luke Shiels both went close.